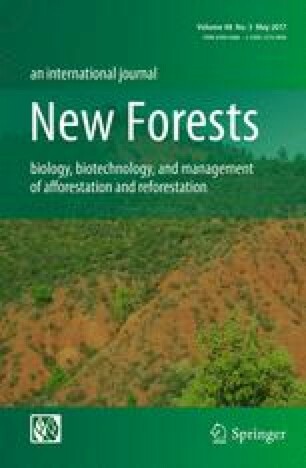 Can bioplastic or woodchip groundcover replace herbicides or plastic mulching for valuable broadleaf plantations in Mediterranean areas? Weed control is fundamental in plantations of valuable broadleaved species. The most common weeding techniques are repeatedly applied herbicides and removable plastic mulching, both raising environmental concerns. We studied the performance of these techniques on a hybrid walnut plantation, compared with three biodegradable mulch alternatives: a prototype bioplastic film, a layer of composted woodchips and a layer of ramial chips. The durability and effect of the treatments on tree performance (survival, growth, physiological traits) and soil features (moisture and temperature) were evaluated over 4 years. Herbicide yielded the best results, while all the mulching treatments provided better results than controls for nearly all the variables. The performance of plastic and bioplastic films was similar, suggesting that the latter could replace plastic mulching. The performance of the two chip mulches was similar and slightly below that of the films, probably because of the excessive thickness of the former (13–14 cm). In summary, biodegradable mulches showed high effectiveness in controlling weeds and so could offer an alternative to herbicide application and plastic mulching when these are contra-indicated technically (accessibility, repeatability), economically (labour cost), legally or environmentally. The experimental design was prepared in collaboration with Philippe Van Lerberghe (IDF-Midi-Pyrénées, France) and Eric Le Boulengé (UCL, Belgium). The authors thank Guillem Martí, Eduard Mauri, Sílvia Busquet, Carla Fuentes, Miquel Sala, Fernando Valencia, Rosalía Domínguez, Sónia Navarro, Àngel Cunill, Alejandro Borque, Sergio Martínez, Toni Gómez and Aleix Guillén for indispensable support during field trial design and/or data collection, Aitor Améztegui for support on data analysis and Terrezu SL and Groencreatie BVBA for providing the prototype biofilm for the trial. This work was supported by project Poctefa 93/08 PIRINOBLE: Valuable broadleaves for restoring and enhancing economic development of rural areas: innovation and technology transfer on sustainable plantation techniques.